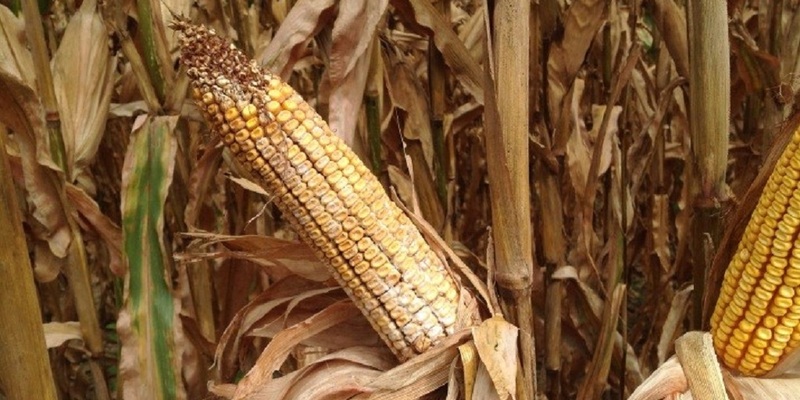 Variable weather conditions are causing ear rots in corn. Some parts of the U.S. have received rain and cooler temperatures, while others have been extremely dry with several days of high temperatures. Regardless of the weather in your area, fungi can cause ear rot in corn, resulting in lighter, poor quality kernels. Some fungi can even produce mycotoxins that will affect the feed value and marketability of grain. Know how to spot the difference between diseases to best manage your conditions in the coming weeks. Weather condition emergence: Cool and wet. Symptoms: White mold ranging coverage from the base of the ear to the entire ear. The white, moldy kernels will also have raised, black bumps, or pycnidia, on them. Management: Adjust combine settings to help discard lighter, diseased kernels. Also, make sure grain is quickly dried to 15-16% to keep the disease from spreading in storage. Weather condition emergence: Warm and dry. Mycotoxin production: Yes (affects swine and equine). Symptoms: A white to pinkish fungal growth on the kernels, and can cause a “starburst” symptom. Fungal growth typically starts at the tip of the ear. Management: Infected grain will need to be dried quickly and stored at 18% or less. Weather condition emergence: Cool and wet (65-70° F). Mycotoxin production: Yes (affects swine). Symptoms: Pink to red fungal growth on the tips of the ear. Silks and husks will sometimes stick to the ear when the disease is severe. Management: Infected grain will need to be stored below 18% to limit storage problems. Weather condition emergence: Hot and dry. Mycotoxin production: Yes (affects livestock in high concentrations). Symptoms: The fungus overwinters on soil debris and infects the kernels through insect damage. The spores on the end of the ear are a yellow to olive green color with powdery mold usually between kernels. Management: Choose hybrids that tolerate water stress and provide appropriate fertilizers. If you suspect ear rot is impacting your fields, speak with your local NK® retailer for additional management recommendations. In your picture one ear is infected and the other right next to it is not. Please explain. I have seen this the last few years .